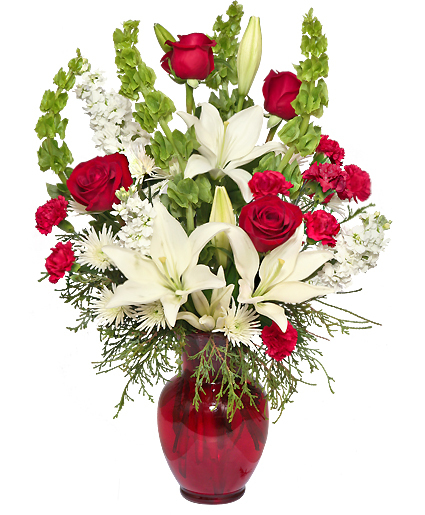 This CLASSICAL CHRISTMAS bouquet is chock-full of reds, whites, and plenty of holiday style and elegance! 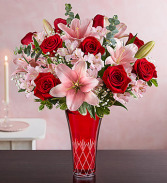 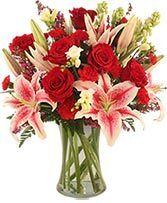 Let Roma Florist Free Delivery Order online deliver this beautiful Christmas gift, along with your wishes for a happy holiday. 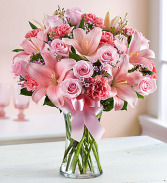 Sometimes, The Best Way To Express How You Feel Is Through Flowers Our Pretty, Allpink Arrangement Is Handdesigned Inside A Clear Glass Vase And Tied With Ribbon To Put Each Beautiful Bloom On Display What A Perfect Way To Put Your Sentiments Front And Center, Specifications, Allaround Arrangement With Pink Roses, Asiatic Lilies, Carnations And Waxflower Accented With Assorted Greenery, To Ensure Lasting Beauty, Lilies May Arrive In Bud Form, And Will Fully Bloom Over The Next Few Days, Artistically Designed Inside A Clear Glass Vase With A Decorative Pink Ribbon Measures H, Our Florists Select The Freshest Flowers Available, So Colors And Varieties May Vary Due To Local Availability, Large Arrangement Measures Approximately H X L, Medium Arrangement Measures Approximately H X L, Small Arrangement Measures Approximately H X L.
Let Your Valentine Know She Holds The Key To Your Heart Our Romantic Arrangement Is Handgathered Inside Our Elegant, New, Ruby Red Keepsake Vase Etched With A Unique Diamondcut Pattern, This Exquisite Design Enhances The Beauty Of Each Bloom While Reminding Her That, Like A Diamond, Your Love Is Forever.